We all like to smell fresh and look good but when someone asks you what beauty products you use, what is it that pops into your head? what items do you think of? Luxury body wash? Your favourite lipstick? Either of these would be right, because beauty products around today range from anything that we use to bath or shower with to the tools we use to apply our make up. Many of us will have a collection of ‘favourites’ the items that we use that suit our skin/ hair / lifestyle and then there will be the other items that we tend to change now and again ( usually as fashion/ styles change). So when you decide to try a new product how do you choose which one to buy? With so many different brands on the market with a range of price tags, it can be difficult to decide on which items are best. Do you buy according to price, assuming that a cheaper item might not work as well or do you buy the most expensive because you think it’s guaranteed to work – justifying the price tag? Well there’s a new way to shop for beauty products that’s becoming more and more popular that helps you overlook the price tag and focus on how much you like the item. What would you say if I told you that you could sample a wide range of quality beauty products at a fraction of the price? Too good to be true I hear you say?… Well, you can! The new trend for beauty products shopping, is through specialist websites where you can purchase beauty products for as little as £2.50 an item! It is true, but (and yes, there is a but) there is a bit of a catch. Now, don’t stop reading here, because the catch isn’t very big and the benefits heavily outweigh them. So, what are these catches – if you’re anything like me you will want to know up front and right away what they are so that you can start to weigh up your options. You usually have to ‘subscribe’. This is where you create an account and agree to make a monthly payment and receive a ‘box’ each month. BUT do not fear – all of the sites that follow this process allow you to cancel the ‘subscription’ after you purchase your first box so you’re not tied into any kind of lengthy contract. You don’t always get to choose the items you want. These beauty sites work by sending you out a goodie box each month filled with a range of beauty items. Once you’ve made your first payment you will receive a little box filled with approximately 5 items, some may be full sized and others may be a sample size. Each site has a slightly different way of selecting the items that get sent to you. Although it can feel a bit like a lucky dip, the sites do tend to show previous month selections so you get an idea of the types of products they stock. Subscriptions are on average £10 plus P&P (don’t worry, I will give a full break down of costs below), meaning it works out on average that each item costs as little as £2.50. When you consider that you don’t actually have to stick to a subscription the concept is a really good one. It allows you to try some of the more expensive brands without having to fork out for it. That way if you try an item and love it you know that it’s well worth the price tag. However if your try it and hate or don’t feel its worth it, you haven’t wasted your money. And the cost – most of the boxes cost the same price as a single foundation! They are also a great gift idea, you can send them to friends and family or even buy a subscription for them. If you’ve decided you want to give it a try, how do you pick which site to use? well, it all depends on what you want to get out of your box. Each beauty site has a slightly different process. Below I have given an outline of three beauty boxes as these are the three that I have tried. It needs to be pointed out that this site doesn’t have a subscription process. It’s probably the best site to try first as you get an idea of the sample sizes and selection but won’t have to remember to cancel any subscription. The second option is to order one of their ‘luxury samples’. There is a two page list of beauty samples that you can order. This is the only site that you can buy sample items. The items are individually priced from £1-10. They will state if they are sample sized or full sized and samples will give you and idea of how many uses you will get out of them. You are limited to one of each item. Finally they have their ‘Latest in Beauty’ collections (they currently only have 2 different options). These are ready made collections that their team have put together. Each box has a theme such as ‘Clean & Fresh’ (£14.95 inc P&P), or ‘Ultimate Discovery’ (£14.95 inc P&P). Each theme will list a selection of items and you will be sent all the items in the box, colours and tones will be based on the information you have provided in your beauty profile (when you sign up you will be asked to fill in some basic questions about your skin tone, beauty habits and hair colouring). Postage and packaging for this site has just been increased to £3.95 and items can take up to 5 working days for delivery once your order has been processed. Birchbox has a subscription process but give easy to follow details if you decide to suspend it. Please note that there is a cut off date for suspending your account each month as payments are processed and sent out on set dates (eg payment is usually taken on the 5th of the month and boxes sent out between 15th – 20th of the month). For first time orders or when re-activating subscriptions, order delivery will be confirmed by email and usually takes 3-5 working days but can sometimes take up to 10 working days. Each month you will receive 4-5 items with a magazine. There is also the chance to purchase these (full sized) items in their shop. They have a rewards scheme where you receive points every time you spend with them. When you purchase a box you will get 1 point for each pound you spend. You can also earn points by filling in surveys to review the items you have received. You have to fill the survey in on the month that you receive the item in order to qualify for points (you can still fill in surveys at a later date for any of the products but won’t receive points if it’s after the month you received it). You will also receive points when you refer your friends. Points can be used to purchase items in their shop. 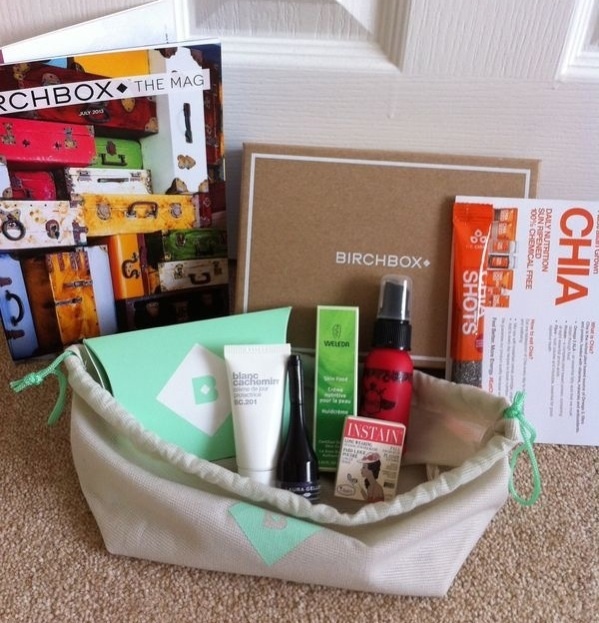 Birchbox costs £12.95 per month including postage and packaging. If you wanted to pay for a subscription up front or get it as a gift you can purchase a subscription for 3 months (£30 plus £2.95 P&P a month), 6 months (£60 plus £2.95 P&P a month) or 12 months (£90 plus £2.95 P&P a month). Love Me Beauty is also subscription run but again give simple instructions for cancelling. The difference with this site is that at the beginning of each month you will be sent an email telling you that the boutique is open. This will take you to their site where there are 3 menus for that month. It’s up to you to select which menu you would like to receive, however they are only open for 28 days* (a countdown clock will be shown). If your subscription is active and you haven’t selected an option by the end date, one will be selected for you automatically. It is best to choose one at the beginning of the month, as once a menu has run out of stock you will be limited to the remaining menus. Boxes are dispatched daily once you have selected your choice, delivery can take 3-5 working days. The advantage of this site is that you will receive exactly what is on the menu you have chosen. There are usually 4 a 5 products in each menu, 1 – 2 are guaranteed to be ‘star items’ (full size) and 3 travel sized. Love Me Beauty also have a a points collection in place as well as reward system. With rewards they offer 1 month free for 3 friends referred, 1 extra sample when 5 surveys are completed and one extra product for every 3 months subscribed (when your subscription is live). Their points system works where you get points for filling in surveys, when you have enough points you can use them to redeem a free box. So there you have it, three great ways to get the latest beauty items for a fraction of the price. I have used all three of these sites and thoroughly enjoyed each experience. If I was to sum them up I would say that Lastest in beauty is best for ordering individual samples, Birchbox and Love Me Beauty are best for rewards if you aim to be a regular subscriber and Love Me Beauty are best if you want only exact items with no surprises. I have come across a few other beauty sample boxes but as I haven’t tried them I am unable to give any personal opinion on them. I have listed them below with a brief summary, if you have come across any others and have tried them please let me know! * I was unable to establish if Love Me Beauty’s boutique is open for 30/28 days. When I tried checking my own personal account it showed 28 days.